Whether your players are plumbing the depths of a treasure vault or escaping through a sewer, no Game Master wants to spend time drawing sites for the complex maze of a thieves’ guild. Fortunately, with Paizo Publishing’s latest Pathfinder Flip-Mat, you don’t have to! 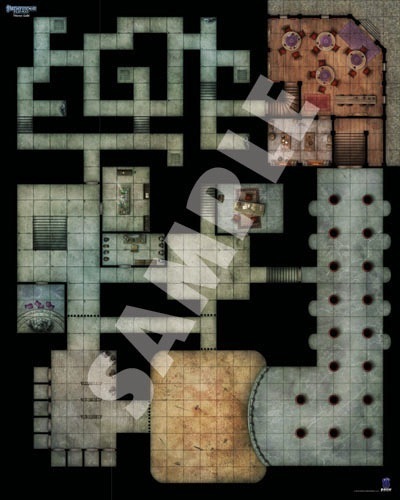 This line of gaming maps provides ready-to-use and captivatingly detailed fantasy set-pieces for the busy Game Master. 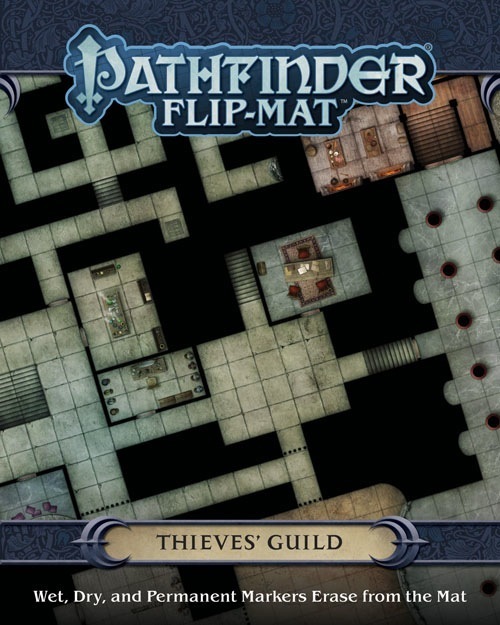 Whether it’s used for a full-on invasion of a thieves’ guild’s headquarters or tracking down a burglar, this double-sided map is the perfect place for larcenous adventure! Don’t waste your time sketching when you could be playing. 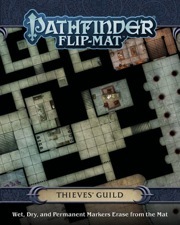 With Pathfinder Flip-Mat: Thieves’ Guild, you’ll always be ready to send your players into a plunderer’s paradise! Announced! Product image is a mockup and will change prior to publication. Updated with final cover image and samples (which are wonky and will be fixed). Am I right in thinking that this cartography matches the sewer map pack like the Watchpost does? Like, can I make a giant map with this, Watchpost, and the Sewer Tunnels and have it appear to be consistent across the board? Looks like it to me, Feegle. It also looks like a great place to set a scenario for PFS. I think that would be the intent. Some time ago paizo stated they were trying to allow overlap in the two lines, with the city market/houses map I think. I'm curious as to when we'll see more terrain maps and less preformed dungeon and single building maps. About 7 of the last 20 have not been single building or prefab dungeons - battlefields, deep forest, town square, pub crawl. I would dearly love to see a simple terrain map like the forest, swamp or desert types maps, perhaps another icy terrain map. My favs recently have been the battlefields and town square maps. It may be just my preference but I find the prefab dungeon maps much more limited in use. That is exactly what it does. It will also not be the last time you will see a Flip-Mat connect to Map Pack: Sewer System. In general I try to find as many natural synergies as I can when I design these things. The the double stairs in the upper right, right of the 'E' go up to a place without a door, room, or passage. That could be the stairwell to the reverse side maybe? Never mind, just looked at it again. I'm curious what design software they used to make the flipmats. I believe that it is mostly Photoshop and the amazing talent of Jason Engle. I know when I make polished maps I use Photoshop, though I'm not nearly as good as Jason at it. When I send Jason the art order he gets the map design as my gaudy colored sketches on graph paper and he makes them look lovely. Any ideas why this product is so seriously delayed? I thought it was originally going to be available for pre-order in September. Now it is listed for December, but the Wastelands mat is already a pre-order item (for release in December). I have been very excited about the Thieves' Guild, but am starting to wonder how long the wait will be. A while back we had a manufacturing issue with the Arcane Dungeon Flip-Mat. Thieves Guild suffered the same problem and we elected to delay its release so we could reprint it. We expect it should be going out in the December subscription shipment. I would love a town interior map (like the pub crawl). People could use it as a base of operations, zombie/ghost town, the start of an adenture. Something similiar to Riverwood in Skyrim with say a blacksmith/some houses/tavern/store etc. 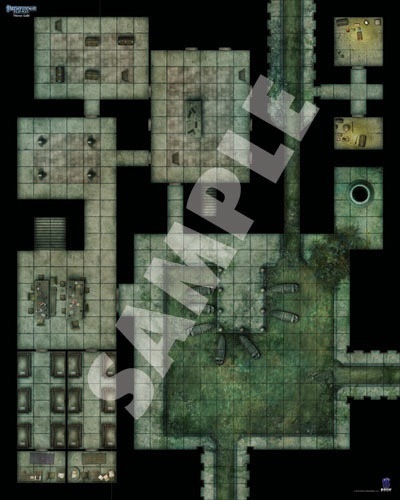 Pubs and dungeon crawls are great but how about a town on on the flip side is the town partially destroyed (see Heroclix batman waterfront map) or a dungeon/crypt under the town temple. I just received mine and I think this is a really well done map. I especially like that it links with the sewer map pack and the Watchpost, and I'm glad to hear that this trend (of linking maps) will continue. Its one of the main reasons I renewed my subscription to Pathfinder maps!